trails. Everyone should wear a helmet. You only need it once! Below are more rides that are fun to do! Paines Creek Beach From Nickerson Park to Paines Creek Beach in Brewster. 13.4 Miles. Back Roads Suitable for mountain bikes only. 13.5 Miles. Long Pond A short circular around Long Pond. 13 Miles. Massachusetts Maritime Academy Ride the canal trail to have lunch with the cadets. 16 Miles. Morris Island Wonderful views from the land's end of Cape Cod. 25.3 Miles. Old Colony Rail Trail Continuation of the Harwich Rail Trail to Crowell Road in Chatham. 14.2 Miles. Dennis Village Ride along Old Bass River Rd to Dennis Village, around the shore. 12 miles. The route has a Senior Version. 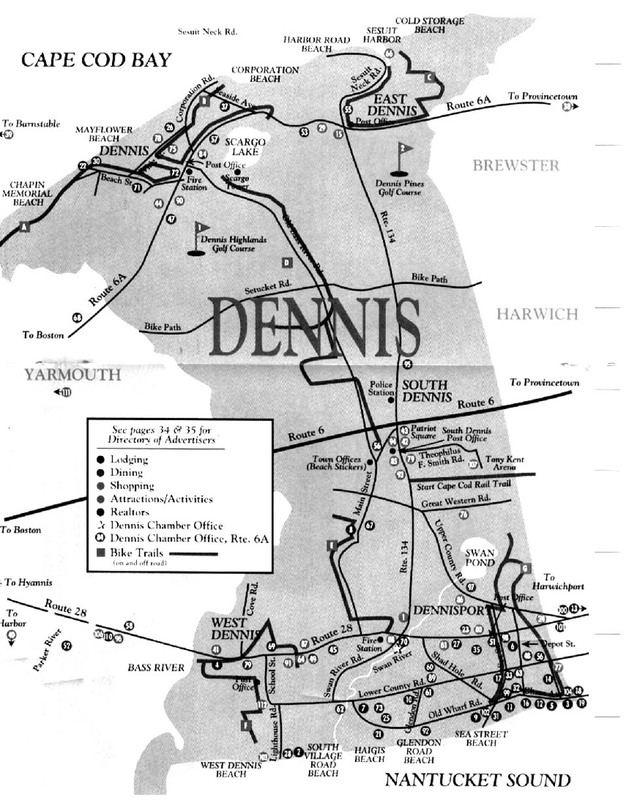 South Dennis A loop using Dennis bike paths and back roads in Dennis and Brewster. 13 Miles. West Dennis A loop to West Dennis Beach, Dennis Port, and South Dennis. 15.8 Miles. Dennis Bicycle Trail Riding trail along Route 134, connect to Old Bass River & Setucket Roads. 13.2 Miles. South Eastham Up the rail trail and back along the bay to Rock Harbor. 10.7 Miles. Eastham Seashore See lighthouses and beaches, returning on shady back roads in Eastham. 10.3 Miles. Eastham Beaches From Salt Pond Visitors Center, visit Bay beaches and see Ocean beaches. 15.2 Miles. Falmouth Heights A beautiful ride along Vineyard Sound. 18 Miles. 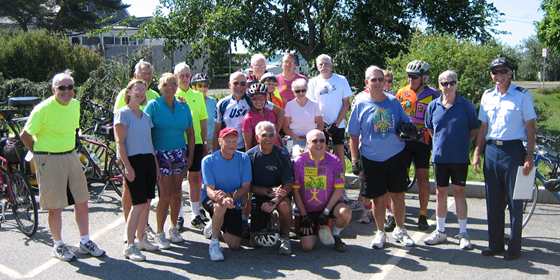 Tour de Falmouth Ride down the west side of Falmouth to Woods Hole, with moderate hills. 24 Miles. Falmouth West A Variation of Tour de Falmouth. 24 Miles. Harwich Rail Trail A loop using the Old Colony Rail Trail in Harwich. 14.4 Miles. Harwich Port By Bay Beaches. 12.5 Miles. Hyannis Port A short but exceptionally scenic ride through Hyannis Port to Craigville Beach. 10.1 Miles. Martha's Vineyard A day trip from Cape Cod. Orleans Beaches A loop ride to the 3 Orleans beaches: Skaket, Rock Harbor, and Nauset. 13.8 Miles. Orleans Landings A tour of the village, expensive homes, and town landings. 15.5 Miles. Orleans Water Views Celebrate Our Orleans Waters. 8.2 Miles. Tour de East Orleans Tour East Orleans landings and ponds. 21 Miles. Osterville-Centerville An enjoyable Ride around Osterville, Centerville and Craigville Beach. 12.9 Miles. Sandwich Ride along the canal trail to end - Railroad Bridge. 12 - 18 Miles. Pamet Harbor Pamet Harbor to Provincetown. A shuttle route. 14.2 Miles. Head of the Meadow A nice loop, on the bike path and Shore Road, with a visit to Cape Cod Light. 10.2 Miles. Wellfleet Harbor Ride along the edge of this vast harbor to Duck Harbor beach. 10 Miles. Wellfleet to Pamet Harbor From the heart of Wellfleet along back roads to Pamet Harbor. 14 Miles. Wellfleet to Corn Hill Beach From Wellfleet center, bike along back roads to Balston Beach, Pamet Harbor and then to Corn Hill beach Truro. Wellfleet to Provincetown A 24 mile ride from the end of paved trail, suggested here as a car shuttle. Tour de Wellfleet A scenic ride through the central area of Wellfleet. 13 Miles. South Yarmouth Tour the ocean beaches facing Nantucket Sound. 12.8 Miles. Yarmouth Bike Trail Ride the bicycle trails in the middle of Yarmouth. 13 Miles. Yarmouth Port A scenic route to Bass River and Gray's Beach. 12.5 Miles.